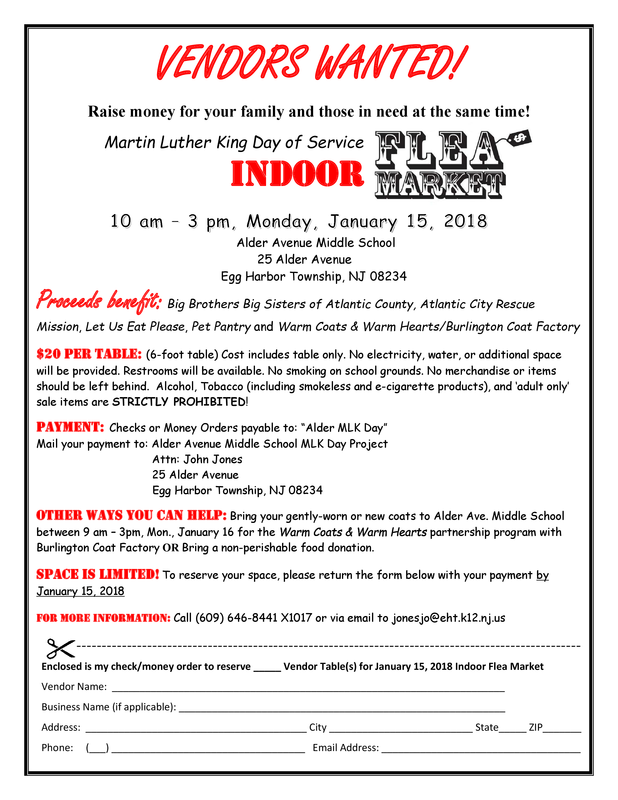 Students and staff from Egg Harbor Township School District (NJ) have partnered with community members, and national and local organizations to host an all-encompassing MLK Day of Service indoor flea market fundraiser that will reinforce our commitment to making a positive difference in the lives of others, and warm coats for local families in need. ​Martin Luther King Day of Service 2018 trailer. For more information on reserving a table for the flea market, download the vendor registration form below. Information on cost, who to send your payment to, and who to contact for further information is on the registration form. Click on the image of the form to download. If you prefer, you can complete the online registration form instead. Please read over the registration form for all the rules before completing the online form. You will still have to send your payment by mail.